Grand Opening Event Series at Paige’s Music – 2 upcoming clinics! We have two clinics with exciting, dynamic jazz artists coming up in the next couple weeks here at Paige’s, and we’d love to have you join us! 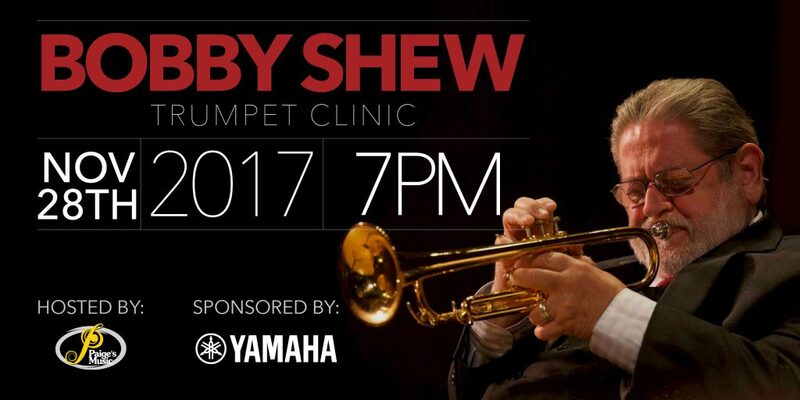 Bobby Shew Trumpet Clinic – Tuesday, November 28, 2017 – FREE! Legendary jazz and studio musican Bobby Shew will be performing and holding a clinic on the Paige’s Music brand new sales floor on November 28th at 7pm. A Yamaha trumpet artist, Shew has been performing professionally since the age of thirteen. A versatile artist, Shew has performed and recorded both as a sideman and a leader in his long and storied career, notably with the Tommy Dorsey Orchestra, Woody Herman’s band, Art Pepper, Horace Silver, Bill Hollman, Oliver Nelson, Benny Goodman, Maynard Ferguson, Neal Hefti, Don Menza, and others.